Odia Samaj United Arab Emirates celebrated Utkal Divas and Aekalavya season 10, at Dubai. 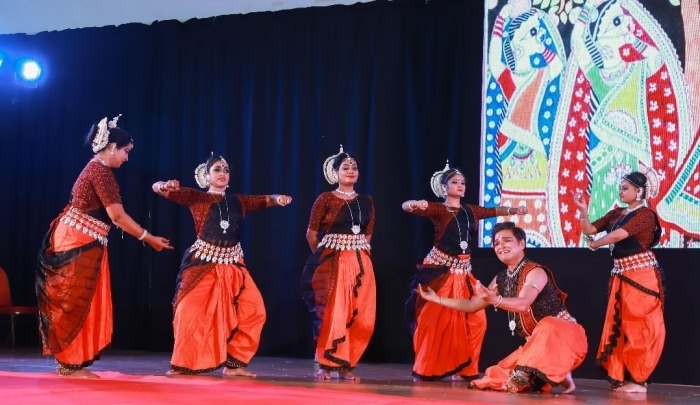 Non-resident Odias in the Middle East and North Africa Region in association with The Consulate General of India hosted this festival on the 13th of April 2018 at The Global Indian International School Al Barsha in Dubai. 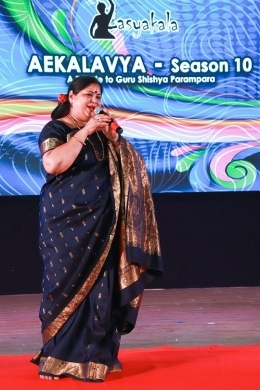 Dr. Sangita Gosain (singer and Chief Executive, Guru Kelucharan Mohapatra Odissi Research Centre) flagged off the evening with a few songs carefully chosen, dedicating the evening to Krishna, 'Jaya shankha gadhadhara nila kalebara pita patambara dehi padam'. She continued with the Krishna theme with Jayadeva's ashtapadi from the Gita Govinda, 'Sakhi hey kesi Madanautharam' composed by Pt. Bhubaneswar Misra. On special request from the audience she sang Palli Geeti, 'Akhali pana pano baro pujiba Ahaha' and 'Phulo rasiya re...' a very popular song from Odia Chala Chitra. She rounded off her vocal rendition with a Hindi song 'Na mai Meera, na mai Radha mai tho hun teri sawariya.' Her tuneful singing was greeted with a thunderous applause. Before the mini Odisha that was created at the venue, a well choreographed Odissi number by Saswat Joshi to the National Anthem of Odisha, "Bande Utkala Janani" written by Kantakabi Lakshmikant Mohapatra was performed by the repertory members of Lasyakala. 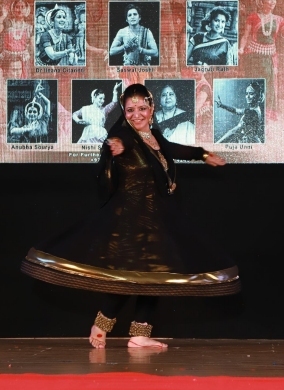 Saswat Joshi is a talented Odissi dancer of the Guru Kelucharan Mohapatra style, a branding partner of Odisha Tourism and Culture and Founder Director of Lasyakala Dance Vision. Disciple of Guru Ileana Citaristi, Saswat Joshi's festival Aekalavya held every year pays tribute to Guru-Sishya Parampara. He made a name with his memorable group performance in Sambalpuri dance in front of the Eiffel Tower in Paris. Brought up in Odisha in an atmosphere of dance and music, it was but natural for him to adopt the performing arts as his profession, even though he had other options open with his master's degree in English Literature from Sambalpur University. Saswat has been sharing stage with his guru in many productions. Here at Dubai, the guru and sishya presented in duet Dasa Mahavidya choreographed by Ileana Citaristi. It had the stalwart musician Pt Ramahari Das accompanied by Guru Banamali Maharana in the musical score. Each incarnation repeated first in its origin, followed by its iconographic features. Dhumavati, the incarnation of Devi born of the sacrificial smoke of Daksha's yagna, where Daksha had insulted Shiva in the presence of his daughter Sati and all the other assembled guests, and where Sati had thrown herself in the fire of the yagna, is full of drama and suspense and took up a lot of performance time in an interesting way. Saswat and Ileana introduced, expanded, adapted, picturized the other incarnations with sensitivity. In the depiction of Kali, the fierce form of Devi or Chinnamasta, the one whose head has been self-decapitated or Bagalamukhi, the one who paralyzes enemies, and the depiction of the fearsome Bhairavi, Ileana Citaristi followed the footsteps of her Guru Kelucharan Mohapatra. In depicting these forms he had almost always made sure there was no sticking out of the tongue and shaking of the hand in front of the tongue to represent these fierce forms of the Devi that made their rendition look unaesthetic. Beauty was the theme and it was beauty that was highlighted. Matangi the Goddess of music, Sodasi or Tripura Sundari, Kamala born of the lotus, Tara our eternal guide, Bhubaneswari, the warm-hearted Ishwari of the universe, depicted the different shades of eternal beauty. Saswat Joshi went solo in Viswa Jagannath showing technical virtuosity as well as emotive ability. Jagannath who is omnipotent and omnipresent was described ecstatically and with a great deal of zeal by the performer. Kanchi Abhiyan was a historical piece performed by the team members of Lasyakala. The story was narrated with one of them stepping forward each time a character had to be introduced. Subhadra Sushmita enacted the role of the Gajapati Raja, Purushottam Deva, while Kanchi Princess Padmavathi was by Monalipsa Nayek. Bibhudatta Das fitted into the role of Jagannatha. Asima, Priyadarshini, Mitali, Jaysikha and others took on different roles at different times according to the demands of the choreography. The storyline centred round the 15th century tale protagonist Gajapati king Purushottam Deva who had gone to the Kanchi kingdom of Vijaynagar and fallen in love with Padmavathi, the Kanchi princess. His love was requited and was soon to be sealed in marriage by the Kanchi king. King Purushottam had invited them to come to Odisha for the ceremony of Rath Yatra. Unable to come in person the Kanchi king sent his minister with his formal proposal of offering his daughter in marriage to the king of Odisha. Sweeping the chariots of Lord Jagannath, Balabhadra and Subhadra and the pathway of the chariots' journey by the king is a ritualistic practice during the Rath Yatra. The minister of the Kanchi king was aghast on seeing King Purushottam Deva in the act of sweeping. He made a hasty retreat and the marriage alliance of princess Padmavati with a supposed sweeper is broken. As per legend, King Purushottam Deva attacked the Kanchi kingdom and was further humiliated on losing the war, but by a dramatic twist in the story, he was asked by Lord Jagannath himself to fight a second war. Lord Jagannath and Balabhadra fought the war on behalf of King Purushottam Deva, who won the war this time. Princess Padmavati was married to the king of Odisha in a grand celebration. The story was enacted with care. Bharatanatyam adavus were used in the dance of the Kanchi princess as she was from a southern kingdom. Costumes and lyrics were in folk style. Kanchi Abhiyan was a brief peep into history and mythology of Odisha. The organizers confided that it was rather strange for the audience to stay back to enjoy the whole program, which extended to almost the whole day - considering the fact that celebrations had started at 10 in the morning going up to 6 in the evening. To mark the tenth year of Aekalavya Festival, the theme chosen was Dasavatar showcasing the ten incarnations of Lord Vishnu penned by Jayadeva. A power point display of the ten incarnations used as a backdrop enhanced the understanding of the theme. The various incarnations of Vishnu were elaborately dramatized, with dancers wearing orange coloured loose costumes to facilitate freedom of movement. The three sights that changed the life of Siddhartha and changed his way of life were enacted. The piece ended with offering prayers to Lord Jagannath, Balabhadra and Subhadra. Ileana performed to a Meera Bhajan. Lakshmikant Palit's music with the backdrop picture of Meera and Krishna went very well with her presentation. She was graceful and delicate in enacting the pangs of separation. Anubha Sourya who is a name in the Odia film world is an ardent devotee of Odissi and a student of Saswat Joshi. She performed Varsha with the different motifs of rain. 'Ghana ghana rasa barasila re' created a romantic atmosphere. 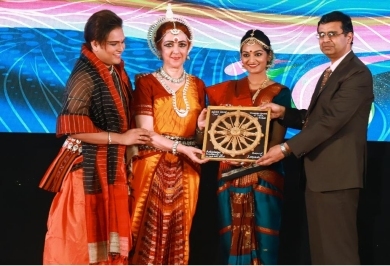 The Aekalavya Samman was awarded to Kathaka Nishi Singh and Bharatanatyam dancer Puja Unni as a part of Lasyakala's endeavour to promote the other classical dances of the country. Tapati Chowdurie learnt dance from Guru Gopinath in his dance institution Natana Niketan in Madras. For a brief period, she was with International Centre for Kathakali in New Delhi. Tapati has a Master's degree in English Literature. Presently, she is a freelance writer on the performing arts.